Remember my sorrowful post about not being able to find canned pumpkin? Well, I still had all of the other ingredients for that delicious-looking Pumpkin Pie Coffee Cake with Crumbled Pecan Topping recipe lying around and wanted to use them (especially the pecans). I didn't have to look long, when I came across a recipe for Butter Pecan Cookies it was a sealed deal! And I knew as soon as I smelled the incredible aroma coming from my oven this was one to share. I decided to add white chocolate chips to my cookies. 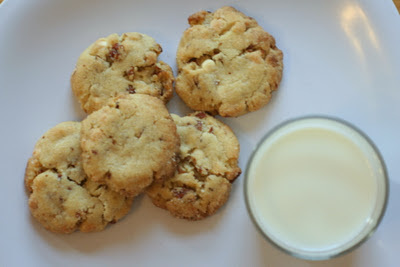 I was inspired by a similar recipe for Butter Pecan Cookies that called for butterscotch chips, but I couldn't find them (another thing the British are missing out on?). The white chocolate chips were a really tasty addition though, so I'm glad I went with them. 1/2 cup (1 stick) unsalted butter at room temp. 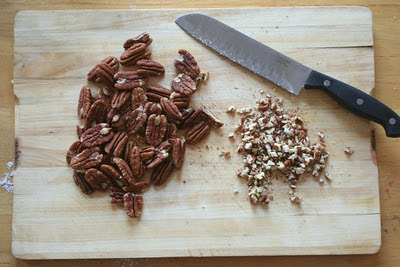 Preheat your oven to 350° F. On a baking-sheet roast your pecans until fragrant (about 6-10 mins). Let cool and then finely chop. Cream your butter for about a minute. Add sugar and blend the two together for another minute. Beat in vanilla, salt and flour. If it seems like hardly any dough, never fear, it'll make at least a dozen cookies. Fold in pecans and white chocolate chips (I used the mini ones). 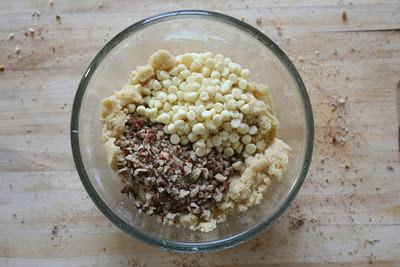 Separate, squeeze and roll dough into small balls. Roll the balls in sugar before placing them on your baking-sheet (about 3 inches apart). Gently flatten with the bottom of a glass. Reshape the edges of the cookies if you want them to be all purdy. Bake until just golden brown (~12 mins). Enjoy them warm with a glass of milk or all on their own! They are seriously so melt-in-your-mouth delicious and perfect for a fall party. If you try them do let me know what you think. My next mission is to make something that involves Nutella, any suggestions? 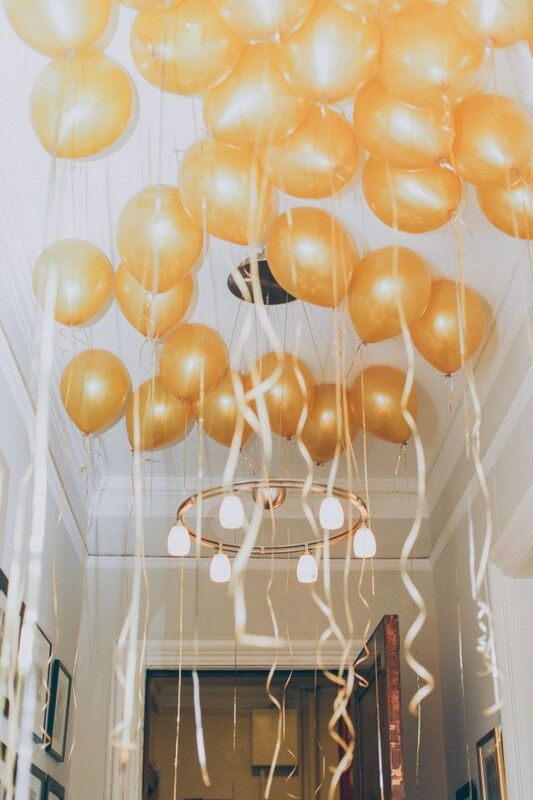 Happy Friday everyone; enjoy your weekend! Oooh yum. I have to watch out during baking season. So tempting to bake EVERYTHING.